Jesse Swift dropped many gears, and he’s quite happy about it. 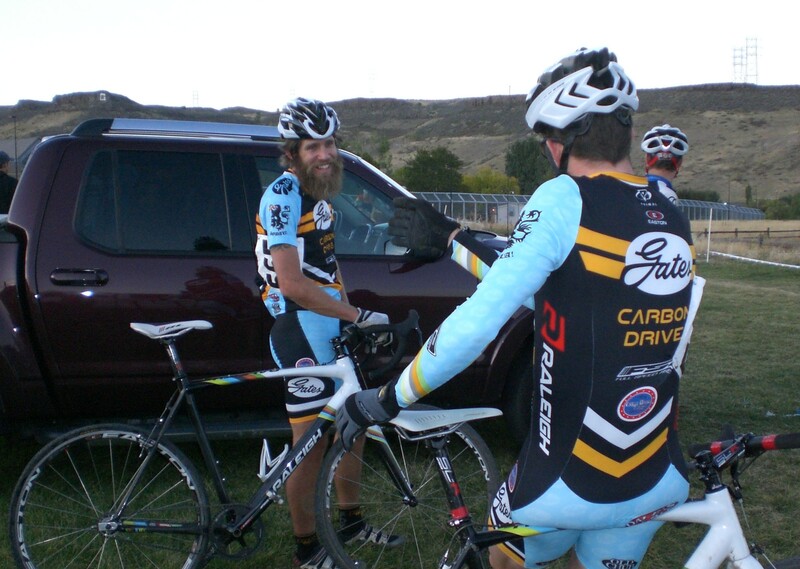 In 2011 he has raced single speed almost exclusively on mountain and cyclocross bikes, joining the Gates Carbon Drive Team in August. “It’s all about the new challenge,” he said. Single speed racing isn’t the only challenge he’s welcomed this year; 2011 is this 36-year-old’s first year racing cyclocross since 2002. In a season that’s by no means complete, he’s achieved an enviable number of victories and top placings in cyclocross. This weekend he competes in the Single Speed Cyclocross World Championships where he takes on his top rival and now friend, Craig Etheridge. Why the single speed challenge? 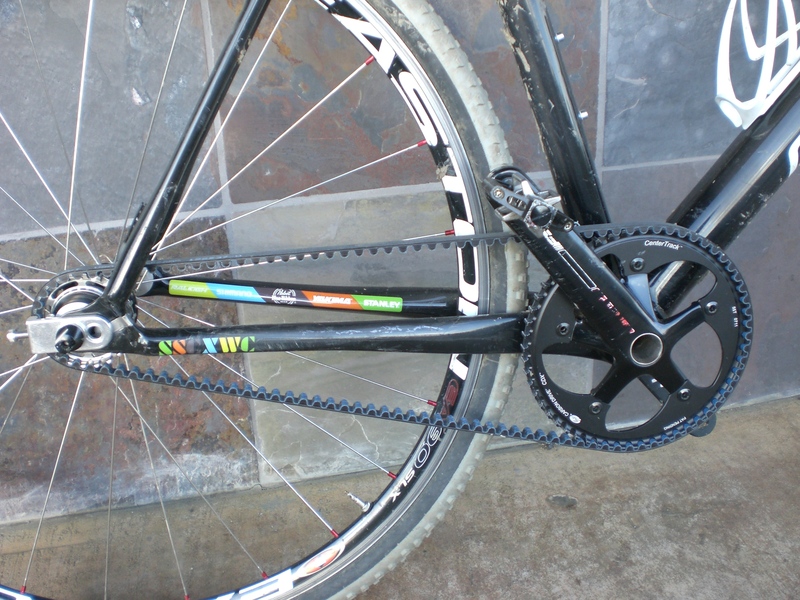 Single speed cycling has stretched Jesse’s thinking about a machine whose components nearly all of us take for granted. 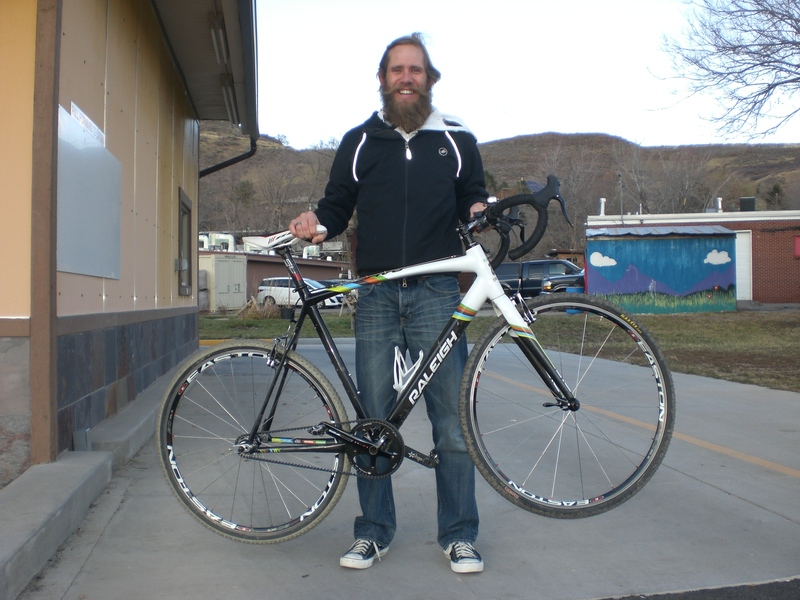 Jesse, who lives in Golden, Colorado and teaches computers to 7th and 8th graders, rides with the Gates Carbon Drive system comprised of belt plus chainring and cog, which he’s heard together can weigh less than a traditional chain. “You don’t think of the chain’s weight,” he said, “because you’ve always accepted that that’s part of [a bike]. You’ve never tried to get rid of it. The carbon belt changes your thoughts about bikes and drive trains.” His carbon frame Raleigh cross bike with the Gates Carbon Drive system feels silly light. He admits the bike handling skills he honed in trials riding while at Fort Lewis College in Durango during the 1990’s aid his cyclocross performance. “I’ve bunny-hopped up onto a wall at chest level, at least 3.5 feet high,” he said. But Jesse doesn’t believe that experience alone creates his winning results. He said, “All biking helps. What I like about cyclocross is it brings all of your background to the table. It challenges you on many levels: fitness, technical skills, speed,” and endurance in the sense of a sustained all-out effort for 45 minutes. Others have lauded the simplicity of a single speed bike because its set-up reduces cost and maintenance. For Jesse it’s actually changed his relationship with the cross bike: “I feel when I’m racing the single speed cross bike you really become focused on yourself, not on the bike. You’re not worried about shifting; you become one with the bike. You just worry about moving forward.” He also mentioned a commonly cited advantage to the carbon drive belt, fewer worries about mud clogging the gears. Jesse doesn’t believe a single speed bike handles differently through mud or sand. The key is selecting a gear that “is easy enough to get through the mud and sand but high enough to keep you going on the grass or pavement.” He carries two gears to a race, a high and a low, and then selects the best gear for the course based on his pre-ride. As a mountain biker whose first race was the Cactus Cup in 1995, he also appreciates cross courses with elevation gain and more dirt surfaces. In 2011 Jesse won the mountain bike single speed category of the Winter Park Epic Series and tied for 1st in the Steamboat Stinger race. But Jesse would call the detractions of single speed minor and considers the single speed cross bike the perfect machine for everything. His training schedule for his first Single Speed Cyclocross World Championships in San Francisco this weekend has included riding and racing as much as possible on his cross bike in addition to racing geared guys several times this season. He will face the guy labeled his “nemesis” by crossresults.com, Craig Etheridge from Seattle. 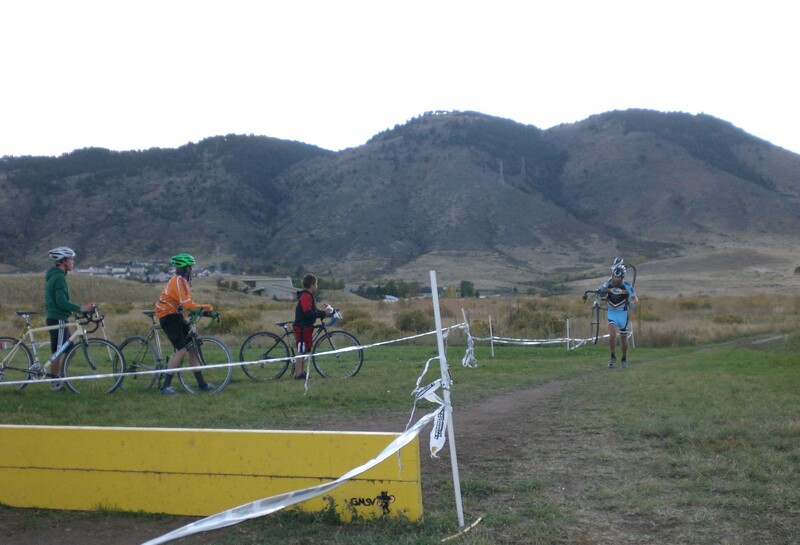 Read Jesse’s Single Speed Cyclocross World Championships race report. 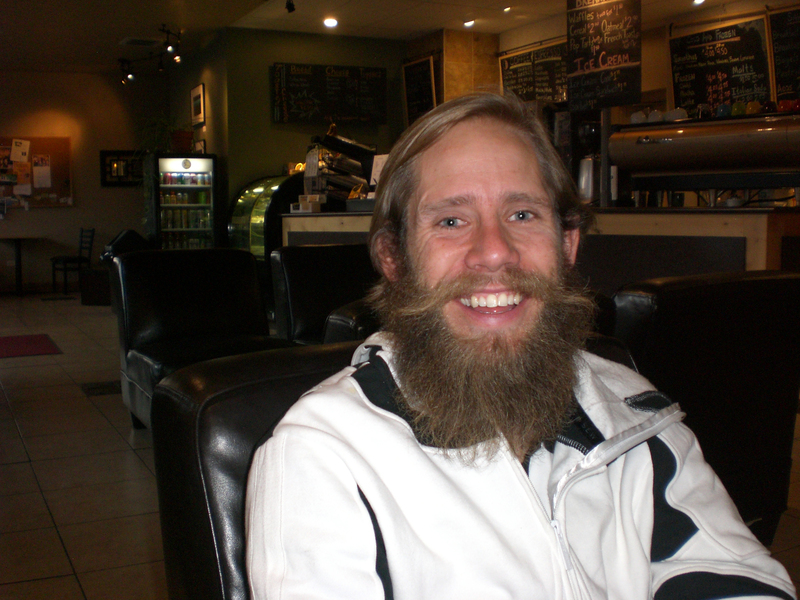 In part 2 of the interview: How Jesse got that crazy beard, and more. Find out if the beard is a keeper.